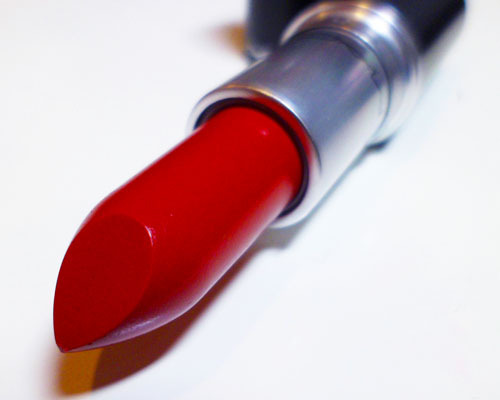 MAC Ruby Woo: The Queen of Scarlet Lipsticks? Ruby Woo is one of those shades that I keep gravitating to at the MAC counter, because it looks like such a gorgeous deep crimson. But I actually hated it every time I swatched it because it was always hard, dry, crumbly, and dragged on the skin horribly. Well, after a few months of dithering, I finally decided to give in and try out a tube for myself, and it turns out that a fresh tube of Ruby Woo is NOT hard, dry, and streaky. It was the way the MAC staff like to dunk the entire lipstick into a beaker of alcohol to sterilize it. Well, DON'T do that people! The repeat contact with alcohol can break down the oils in the lipstick and leech it out of the tube. I suppose you might not have a choice if that is a tester that two dozen people swatched onto their hands and lips each day, but if you own one for personal use or are a makeup artist and need to use it on clients, then just spray the top of the bullet with alcohol and wipe on a sheet of tissue to remove the top layer. This way, the rest of the product stays fresh. As you can see, Ruby Woo is the brightest of the MAC reds I own. All 3 are Mattes, but Ruby Woo is a retro matte, which means it is even denser and dryer than the other 2. The retro matte texture is actually lighter feeling than the regular mattes, which have more emollients and hence go on thicker and feel a bit tackier/stickier. Ruby Woo has almost zero sheen compared to the other 2 above, but I don't find it to emphasize lines on the lips. The other thing I love is that right after application, you can kiss a sheet of tissue and there will be minimal transfer. When I layer a second coat on and kiss again, it's the same thing. The color looks darker in the tube than it is when applied, so if you are looking for a true, true red Ruby Woo is better. But because of this same fact, it can look different depending on your skin tone. If you have a more yellow undertone, this lipstick will look warmer. If you are porcelain or pink based skin, the lipstick looks more cool blue. If you like the way it looks in the tube form (a deep intense red), or if you have a medium-to-deeper skin tone, then go for Russian Red instead as it will show up less coral on you. Neither of these are a true blue-based red, even though MAC describes it that way on their site. These lean neither orange nor magenta so I'd call them true reds instead, which are easier for most people to wear. Diva on the other hand, is a dark blue-based red with slight plum undertones. At the end of the day, some of them scrape of the tops of the lipstick (you will notice some lipsticks have that ribbed top) but for a quick disinfect when they need to apply something on a customer, they'll often dip it in alcohol. Ruby Woo seems in between Lady Danger (my favorite) and Russian Red. Given that I don't quite love Russian Red on me I might have to give Ruby Woo a shot! You're right! It's between the 2! Russian Red has a bit more brown to it, and Lady Danger has more orange. It helps to apply just a tiny bit of moisture to the lips before application and then kissing it away, so you can apply Ruby Woo smoothly without changing the texture. Great review, but I wish you went into more detail over Diva, I love the look of it! I'm keen to try it out. Hi AngelDust, I LOVE Diva. Good finish, and beautiful color that seems to work on so many skins.) I'll do a separate review on it if you need, but didn't go into detail in this post as it was on Ruby Woo specifically. Nice review! It looks beautiful on you! I just bought mine! Hi Emily, fantastic! Hope you enjoy the color as much as I do! following upgrade AndroDumpper group please make a pin AndroDumpper Download please upgrade WAP/WAP2 HACK and also Overall AndroDumpper.